32 Cards is an exciting free digital trading card game loved by both kids and adults. 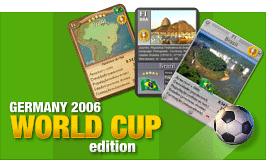 This special World Cup Edition has one card for each one of the 32 countries that will dispute the football (soccer) Cup in Germany in June 2006. 32 Cards has a fully themed interface that is designed to please the most demanding football (soccer) fans among you. The game comes with literally hundreds of interesting data about each country, including World Cup and football (soccer)-related information, geography, population, and more. You can browse the card sets freely just like in the real world. 32 Cards is guaranteed to provide many hours of healthy entertainment to you, your kids and your whole family. Copyright � Hypervisual. All rights reserved.